Demands in off-road racing are changing with greater speeds, traction and differing weight distributions from old, drivers are demanding a different tyre set-up. With this in mind Schumacher has brought back the 2×20 stud tyre in yellow compound. Suitable for use on the front of both 2WD and 4WD buggies, the tyre sits in between the Mini Spike and Stagger Rib tyre in terms of grip and enables fine-tuning of the handling characteristics. 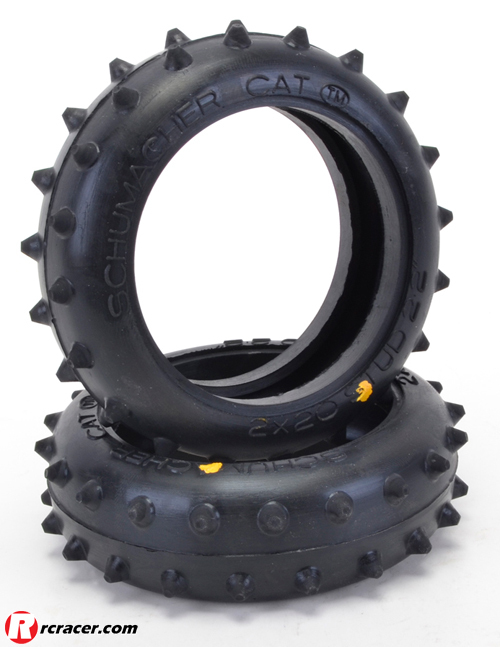 Schumacher feel that this tyre is best suited to grass and Astro surfaces using the #U6733 Medium Front Insert.